I liked the location. The room was updated. It could use a carpet at the front door to get the sand off your feet. Place is well maintained, friendly staff and excellent ocean location. Parking is somewhat lacking enough spaces some nights. The carpeting in the bedroom was wet. Housekeeping responsibilities should have been clearly defined. Nice property, modern design, clean room, instant access to the beach, hot tub, pool. Place could use a makeover but room was large with a small balcony that had an ocean view. Okay breakfast and great location on the beach. Very reasonable price, I would stay there again. Everything was greaat. Room clean and comfortable. The hallway had a bit of an Oder, but the room was fine. It was actually quiet considering it was Daytona. I really could have used a hot tub. Check-in was fast. The room was comfortable. The hotel surroundings is clean and so was the room. This hotel is in walking distance of food eateries and hangouts. So you're kicking around the idea of a getaway to Ormond Beach? 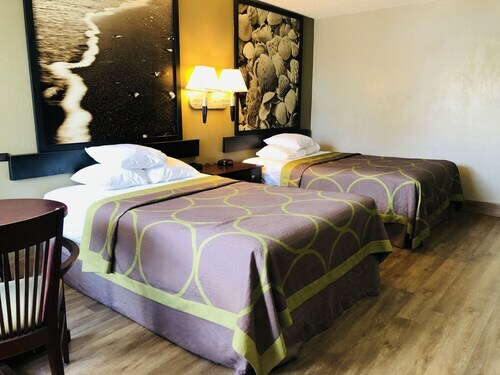 If you want a place to lay your head that's located close to Ormond Beach attractions, use Orbitz to pick your travel dates, and then presto! Look through the list of hotels and other accommodations to identify those that are close to what you want to see. We make it easy to find a convenient flight to Daytona Beach, FL (DAB-Daytona Beach Intl. ), which is 6.8 mi (10.9 km) from the city center. Find the perfect flight in a flash by using the filters on our site to narrow down your search. To get lodging that has lots of the extras you like when you travel, use Orbitz to get your must-have amenities whether that's a swimming pool, free parking, or a kitchen. Go swimming when you stay at one of these Ormond Beach properties, liked for their pools. What's the Weather Like in Ormond Beach? The furnishings were old. The room had been done in ceramic tile and was nicely painted but the ceiling fan did not work. The sidewalk tiles outside my door was gone leaving a big square hole to trip on in the dark. Parking was just plain stupid. Pool area tho was beautiful and clean. Service was lousy. I had to throw my towels outside to get more. Breakfast was bread or cereal. Entering and leaving was restricted with poles or cars. Expensive! But on the beach.